The lazy days of summer are almost here. Shake up your summertime routine and start making memories with an adventure the whole family can enjoy together! We’ve rounded up our top picks to keep parents and kids happy, active, and engaged this season. 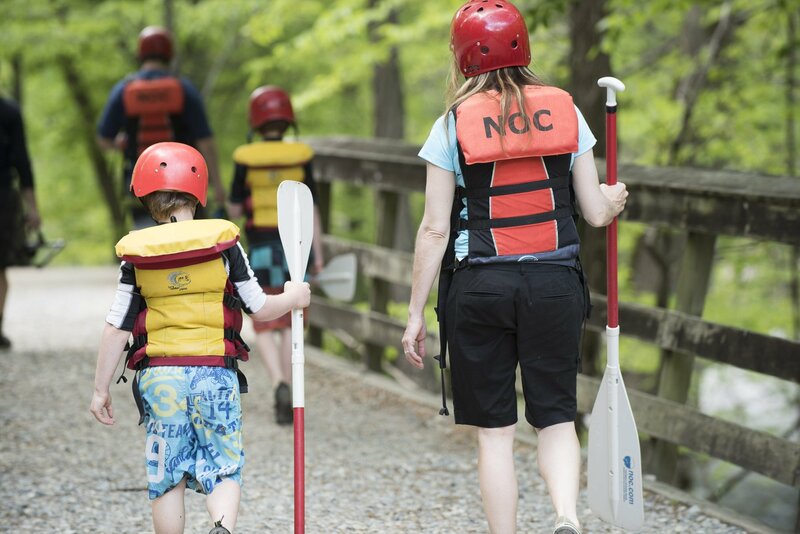 Save almost $100 when you try four of NOC's most popular activities with the Nantahala Adventure Pass. Splash your way down the Nantahala River in a raft or ducky. Test your skills at the Zip Line Adventure Park, a challenge course with 16 aerial obstacles, plus the 550-foot Wesser Zip. Mountain bike Flint Ridge Trail and enjoy beautiful views of the Nantahala National Forest and river below. Kayak or stand-up paddleboard on Fontana Lake and discover waterfalls and wildlife. This is absolutely NOC's best value for a full day of fun. Heading to Gatlinburg or Pigeon Forge this summer? Add some adventure with a whitewater rafting trip on the Pigeon River. Raft the Upper Pigeon's splashy Class III and IV rapids, including Accelerator, Roller Coaster and Lost Guide, or float the Lower Pigeon if gentle rapids and swimming holes are more your speed. Ready for more? Add a guided hiking trip to explore some of the area's scenic waterfalls. Be sure to visit NOC's Gatlinburg store for our signature "gifts, gear, and guidance," plus a kid-friendly swinging rope bridge, bear cave, and two-story climbing wall. If your family is looking for a rafting trip with big waves, warm water and non-stop whitewater action, you'll love the "Ocoee Coaster." The Middle Ocoee earns its title as "America's most popular river trip" and is ideal for high-energy teens who are ready to dig into Class III and IV rapids like Broken Nose, Tablesaw, and Hell Hole. For the ultimate adventure, try NOC's full-day Ocoee trip: Five miles of stout Class IV rapids - including the 1996 Olympic whitewater course- followed by a freshly prepared riverside lunch and a run down the Middle. The French Broad flows deep in Western North Carolina's Pisgah National Forest, yet it's only minutes from downtown Asheville. This family-friendly river boasts warm water, mountain views and plenty of splashy Class II and III rapids, like Big Pillow, S-Turn and The Ledges. You'll learn the history of the river and see wildlife, such as heron and kingfishers, bald eagles, and, if you're lucky, a black bear. Raft five miles on a half-day trip or spend the day and enjoy eight miles of fun whitewater - including the eminent Class IV Frank Bell's Rapid - plus a freshly prepared riverside lunch. The Chattooga River is the Southeast’s premier whitewater rafting adventure, named “The #1 Thing Every Southerner Ought to Do” by Southern Living. Considered one of the most beautiful rivers in the country – boasting crystal-clear water, sandy beaches and huge granite boulders – the Chattooga is protected under the Wild & Scenic Rivers Act, which celebrates its 50th anniversary this year. Section III offers milder rapids, swimming holes and an optional run through Bull Sluice rapid. Section IV dials it up a notch with steep, technical rapids like Seven Foot Falls, Raven’s Chute and Jawbone. Both trips feature a freshly prepared riverside lunch. NOC's Paddling School was voted "Best Place to Learn" by Outside Magazine, and we've taught more paddlers than anyone else in the industry. Our private canoe and kayak instruction courses are customized based on your family's goals, so you can focus on what matters most, whether that's getting in a boat for the first time, mastering your kayak roll, or running the river. Each Private Instruction course is led by one of our professional river instructors, and up to five family members and/or friends can participate. We provide all gear and transportation, plus a waterside lunch for full-day lessons.